Contemporary Art from the United Arab Emirates, including works from the ADMAF Art Collection. me Collectors Room Berlin, Sept. - Oct. 2017. 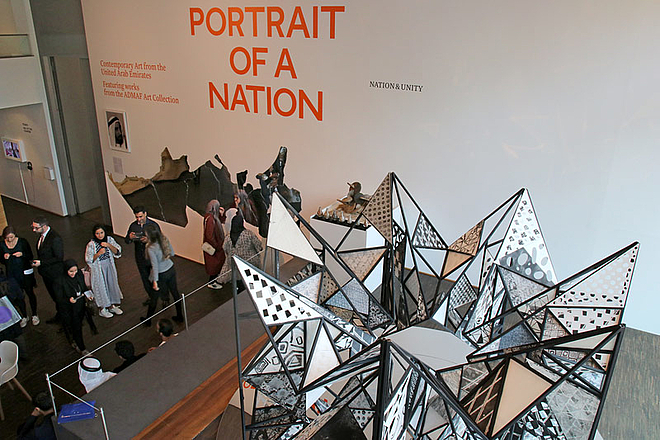 The exhibition Portrait of a Nation offers a glimpse into the creative practices of 50 contemporary artists from the United Arab Emirates (UAE). Visitors are invited to explore the country through the individual perspectives of the participating artists who call it home. The exhibition is divided into seven themed rooms: Nation & Unity, Geography & Nature, Architecture & Urbanism, Portraiture & Identity, Religion & Spirituality, Language & Calligraphy, and Tradition & Heritage. Founded in 1971 the UAE is today home to some 200 nationalities. The exhibition offers a rare glimpse into its little-known history and diversity while considering significant contemporary questions of heritage and identity. Against a backdrop of rapid development and globalisation, the works explore complex ideas of modern nationhood, visiting urban and rural landscapes and examining major issues of unity, spirituality, and language. Tracing the nation’s shifting identity, the exhibition includes 20 specially commissioned works by emerging and established artists. These new reflections are contextualised by seminal pieces dating back to the birth of the country. Three generations of renowned Emirati artists arepresented; from Hassan Sharif and his atelier students to younger artists. The exhibition presents a variety of mediums: sculpture, photography, land art, painting, textiles, video, scenography, and new takes on traditional crafts. One of the largest exhibitions of Emirati art, Portrait of a Nation opened in Abu Dhabi in 2016. Now staged abroad for the first time, it prompts urgent and globally relevant questions on identity and exchange in the 21st century. The exhibition features works from the collection of the Abu Dhabi Music & Arts Foundation (ADMAF), among the oldest, non-profit cultural organisations in the Arabian Gulf and organiser of the Abu Dhabi Festival. Founded in 1996, ADMAF has pioneered new artistic practices over the last 20 years, seeking to deepen global cross-cultural dialogue and inspire a renewed interest in the creativity of the UAE and the wider Arab region. 57th Venice Biennale 2017. Rock, Paper, Scissors: Positions in Play. Curator: Hammad Nasar; Artists: Nujoom Alghanem, Sara Al Haddad, Vikram Divecha, Lantian Xie, Mohamed Yousif. 56th Venice Biennale 2015. 1980 - Today: Exhibitions in the UAE. The emergence of contemporary art practices. Curator: Sheikha Hoor Al Qasimi. 15 artists.